From left, Indiana University first lady Laurie Burns McRobbie, Sarah Johnson, Lindsey Lloyd, Jennifer Mason, Laura Schook, Alexis Stephenson and Chancellor Ray Wallace at the Women Helping Women: Honoring Student Volunteer Leadership awards luncheon on Thursday, April 21. 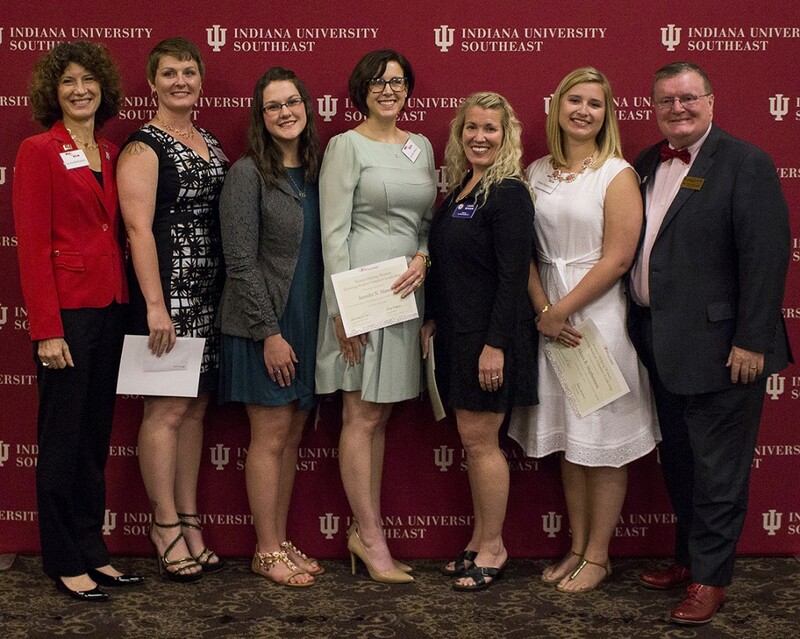 Indiana University Southeast honored five students with Women Helping Women: Honoring Student Volunteer Leadership awards from the Indiana University Women’s Philanthropy Leadership Council (WPLC) on Thursday, April 21, 2016. Students Sarah Johnson, Lindsey Lloyd, Jennifer Mason, Laura Schook and Alexis Stephenson received awards from Indiana University first lady Laurie Burns McRobbie, founding co-chair of the WPLC at IU. Each of the honorees received a certificate and a monetary donation to her volunteer organization at a luncheon in their honor. Sarah Johnson, a graduate business student from Pekin, Indiana, supports soldiers and their families as the chair of the Family Readiness Group. Her award will support Joint Services Support (Indiana National Guard). Lindsey Lloyd, a junior nursing student from Depauw, Indiana, assists in administrative work and develops strategies to achieve fundraising goals for the Comfort House. Her award will support the Comfort House Child Advocacy Center. Jennifer Mason, an interdisciplinary studies graduate student from Floyds Knobs, Indiana, empowers middle school students to improve self-confidence, social skills and academic performance. Her award will support the Mentor Mii Program for the New Albany-Floyd County School Corporation. Laura Schook, a criminology junior with a minor in psychology from Greenville, Indiana, coordinates a Placed Veterans Program and promotes fundraising initiatives such as Toys for Tots and the Crusade for Children. Her award will support the American Legion Auxiliary Post No. 42. Alexis Stephenson, a senior nursing student from Louisville, mentors high school girls as a youth group leader. Her award will support Southeast Christian Church. Michele Boillotat, director of the WPLC, said the five award recipients have found their passions through volunteering. Chancellor Ray Wallace said that as IU Southeast celebrates its 75th anniversary, the University looks to leaders like Johnson, Lloyd, Mason, Schook and Stephenson to help it create another successful 75 years of serving the people of Southern Indiana. The Women Helping Women awards program began in 2012 honoring three students from IU Kokomo for their volunteer service. About the Indiana University Women’s Philanthropy Leadership Council: Convened by the Indiana University Foundation Board of Directors in 2010 as the Women’s Philanthropy Council, the WPLC’s mission is to lead fundraising and engagement efforts that inspire women to give of their time, talent and resources to Indiana University, and to develop women leaders in philanthropy.